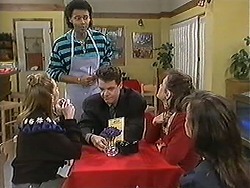 Paul, Mel, Caroline and Chrissie are all at a table and Eddie comes to serve them. Chrissie goes to order but Caroline reminds her that she eats the Danish pastry and then Caroline's the one that puts on the weight! Chrissie doesn't understand why Paul and Caroline are so excited about a business convention. Paul explains its business and pleasure and he's going to lay back! Caroline tells her they have competition and she's working on a presentation that will knock everyone's socks off. A woman comes in and thanks Caroline for the table she bough from her shop, but then notices Chrissie. Chrissie explains that she's the one that owns the shop. The woman walks off and Mel doesn't think she could ever be a twin. Chrissie is jealous that Caroline is going away, but Paul offers for her to go to. He puts Mel in charge. Helen tells Todd and Cody that they can't practice at hers today, she has calls to make and it's Tracey and Rosemary's last day. Melissa and Josh arrive and Todd says they can't practice. Melissa notices that Cody has a friendship ring from Todd. They all agree to meet at the Coffee Shop and then go shopping later. Joe has come to check on the bets, which isn't looking good, everyone is betting on Joe! Eddie thinks they need to find some people who will bet on the other contestants. Joe hopes he can win and Eddie tells him there's three key things: practice, practice and practice. Joe says he has his lucky darts – which is all he needs. 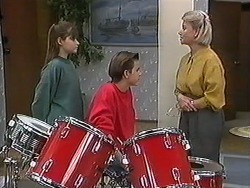 Caroline wishes Josh good luck with the band. He sits at a table to wait for Melissa. Eddie comes over and Josh tells him his plans to go shopping. He also tells Eddie he's loaded. 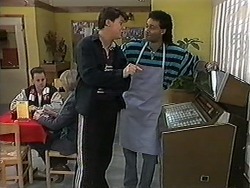 Eddie tries to get him to bet in the darts competition but Josh's not interested. Helen, Tracey and Rosemary are all chatting at the table. Rosemary says that Tracey is in charge of the shopping today and Helen asks her plans, which are head for the city and hope for the best. They talk about Rosemary's favourite game when she was younger “North West by South East” where you get to your destination by going in the opposite direction. Rosemary says it's OK, they're going to stay on the main roads. Helen says she's going to miss them, and Tracey admits she's nervous. Helen says she expects lots of postcards and if she struggles at school with anything then she always has Rosemary. Tracey smiles and takes Rosemary's hand, saying she knows. Rosemary admits that she needs looking after too so they agree to look after one another. Josh and Melissa are shopping. They walk past a jewellery shop, the same one that Cody's ring came from. Melissa obviously wants a ring herself and gets her hopes high when Josh says they'll meet back there in half an hour with a surprise. He leaves her and she looks at the rings in the window. Madge wants to talk to Eddie about the betting. Madge tells Eddie that Paul's looking for him, if she's found out about Eddie's betting activities then Paul probably has as well. He asks Madge to cover for him. Madge says if he's taking bets at the Coffee Shop, Harold will go mad and she can't hide it from him if he asks, but agrees to keep her mouth shut. She tells him it has to stop and Eddie says things won't get any worse than they are already. Caroline is having her photo done for an ID card, Chrissie then has hers done. Caroline wonders why they need to have them done for this conference. When he's done with Chrissie Paul asks the photographer to do some family snaps – on him. He calls Mel into his office. Paul wants Mel to get the prints to him ASAP. Mel suggests that Paul could have used Caroline's photo from the hotel brochure and saved some money, Paul is impressed with her thinking. Josh and Melissa meet up Josh tells her all about this new software he's got for the computer, but he's spent all his money. Melissa is unimpressed – she thought she was getting a surprise. He says she did – the computer game! Melissa wants to go and walks off. Josh stops her and asks if she's OK. She doesn't care. JOSH: Just because you didn't find anything to buy doesn't mean it's the end of the world. Caroline comes up with some suggestions for the presentation later, and Paul agrees with them. Caroline offers to sort out Chrissie for the conference but Paul said she's already booked and everything as he did it at lunch. Caroline looks a bit put out. Mel comes in and sends Caroline out for a package and asks Paul to sign something. Paul asks Mel what size Caroline and Chrissie are, Mel thinks size 8. He explains he wants to get them both something for the trip and tells Mel to keep it a secret. Mel leaves the room and Paul makes a phone call and orders 2 dresses and 2 bikinis – both in matching colours. Jim gets off the phone and goes through to Helen. 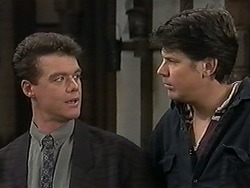 He tells her about the phone call and also that Beverly will be returning tomorrow – and so the house won't be empty when Rosemary and Tracey are gone. Helen hugs him and is very pleased. Caroline asks if Mel will be OK when they're gone. She says she's looking forward to it. Chrissie comes in and Caroline asks what's wrong. Chrissie says she's seen the itinerary for the trip and doesn't know what to do – she needs to go shopping. MEL: NO! No. You can't. I mean, wouldn't it me cheaper to buy stuff up there? Mel tries to talk her around, and then Caroline says that they can just share clothes. Mel thinks that's a great idea! Joe is practising and Eddie comes in. Madge says Paul was looking for him. Eddie and Joe talk – the situation isn't looking good. Paul comes in and wants to speak with Eddie – is he taking bets on the darts competition? Eddie confesses. Paul wants to place a bet and he'll overlook it this time. He puts $10 on Joe. Josh comes to sit with Melissa. He asks what he's done. Melissa says he's done nothing and as he spent so much on computer games today he should go and play them. Cody and Todd call Josh over. Todd asks what's wrong but Josh says Melissa is mad and he doesn't know why. Cody gets up to see Melissa. Todd wonders why Melissa could be upset when he bought her a friendship ring. Josh says he didn't, they went shopping for software. Josh realises what he's done and he's going to make it up for her. Melissa isn't very happy, it's the fact he didn't think of it which hurts most. Melissa's not going to dump him, just teach him a lesson.